So you’ve got your marketing automation (MA) system in place. But what do you put in it? You know you’ve got to fill it with leads and campaigns, but how? The truth is, marketing automation is a system that’s very tactical in nature. It begins with creating awareness with inquiries and marketing qualified leads (MQLs), then continuing the conversation with those people so you can move them through the funnel. There’s actually a healthy recipe for doing this, and we’re about to give it to you. But before you start mixing, consider taking the following steps, which will help your use the recipe to move inquiries and MQLs through your funnel more effectively. • Take inventory of your content: Every organization has existing content, but you may not be aware of it. Take the time and effort to create a complete inventory of all usable content. You’ll need it for your nurture campaigns. Determine where each piece is best used, and remember, some content can be used in different places. This exercise demystifies whether or not you actually have enough content to proceed with your nurture campaigns, and where there are gaps. • Use a nurture product brief: This is the most important step and helps you define the goal of the nurture campaign. Is it to get a recipient to sign up for a free trial? To download content? To buy an upgrade? It’s important to know your goal ahead of time, and the necessary steps to achieve it, and the brief helps you do that. It also helps you decide who should enter the nurture, and enables you to create filters to exclude those who shouldn’t. For example, if it’s a free trial nurture, there’s no need to include customers. • Determine a good frequency: Don’t become white noise. There are different frequencies depending on the situation. If you’re holding a webinar, and someone signs up for the webinar, then certainly send them a confirmation immediately. But if you’re sending them a link to a whitepaper, give them some time to read and digest it before you follow up. • Document the workflow: This step saves considerable time and enables you to visualize how your campaign will flow. You can plan decision rules that affect the flow to define who enters the flow and when, and who exist and when, and you have a recipe in black and white for future use, in case you forget. Each touch in the nurture is an ingredient. The recipe should document each of the touches, including the objective, the sender, the tone, copy requirements, call to action, and form and landing page requirements. By writing it out, everyone involved knows what needs to be done. • Keep your emails short: Everybody hates long emails. Think of the email as an invitation to your content. Don’t describe your content too much; instead entice your lead to read it. • Make your conversation personal: You’ll have higher open rates and more success if your email comes from a person, not an organization. Use the folks involved in your campaigns, or the account managers. Build, test, launch, review and update, as needed. 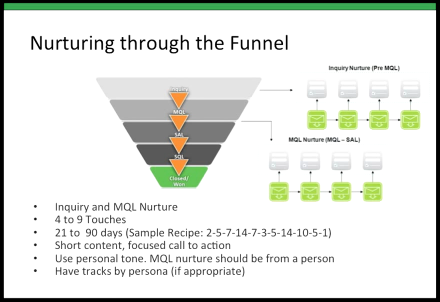 Watch the entire Content Marketing Bootcamp presentation to learn more about lead nurturing and content strategy for mid-funnel.